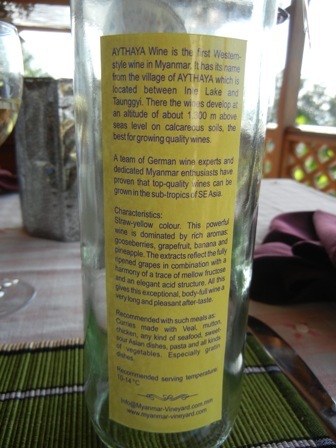 My friend Moritz brought some bottles of wine from a trip to Burma back to Bangkok. 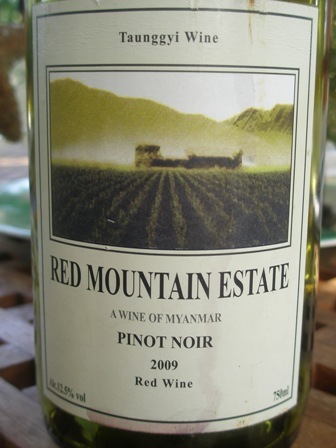 He gave me a ‘2009 Pinot Noir Taunggyi Wine’ by Red Mountain Estate which is located in the Southern Shan State at the picturesque Inle lake. 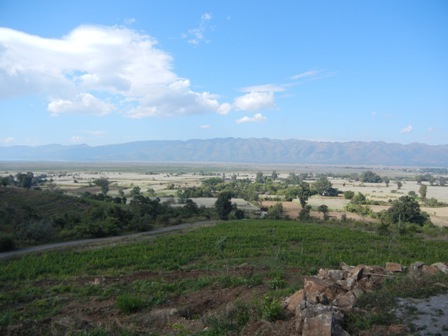 The vineyard was planted in 2003 at about 1000 meters altitude. 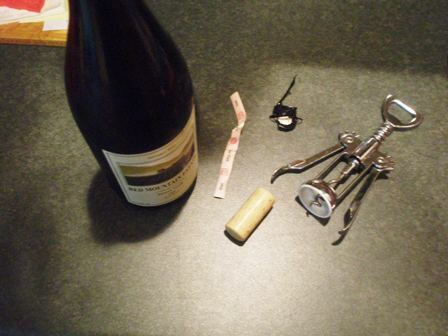 When I opened the bottle and found a plastic “cork” my enthusiasm declined rapidly. Well, what will the wine taste like, I thought, with such an enclosure? To say it from the outset, the wine is a project in the making. 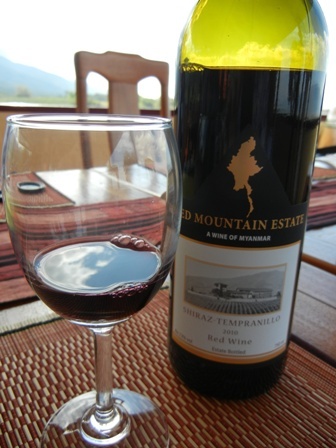 The technology used by Red Mountain Estate may be ultra modern. All equipment is imported from Europe and the wine is aged in Hungarian oak. 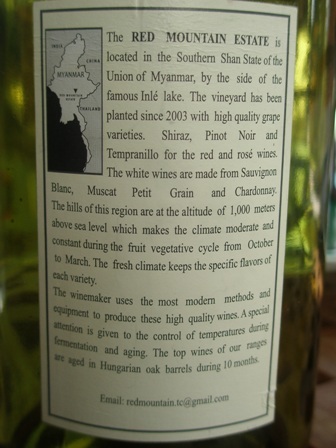 However, the tropical conditions, as customary to New Latitude wines, is still a challenge. The colour of the wine is a dark red. 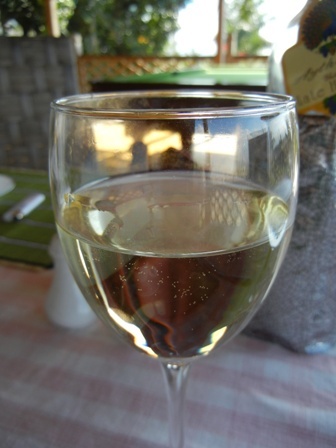 It is medium bodied and has 12.5 % alcohol. The taste is a mixture of saw dust and rubber, not unpleasant though, and perfectly drinkable. 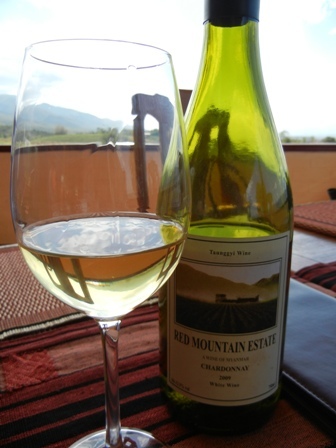 I had the chance to taste some more of the Red Mountain Estate products at Moritz’s house. I liked the Chardonnay best followed by the Rose. The reds were not particularly strong, a bit thin, for my taste. As I said, work in progress. 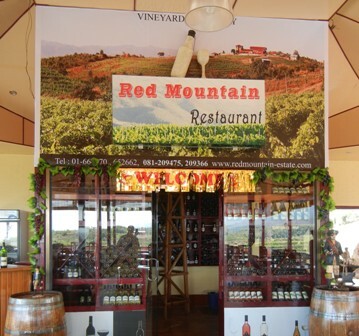 The location of Red Mountain Estate is very beautiful, almost spectacular. 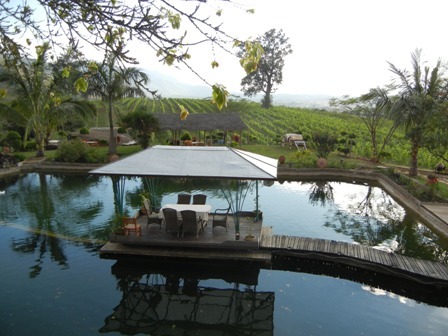 Photos of the Inle Lake, the vineyard and the winery can be found on the estate’s webpage (Moritz has some on his facebook site). 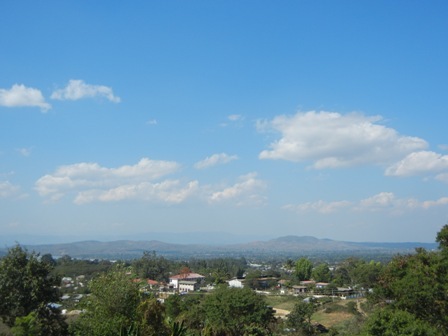 I should visit this region and have a look myself. 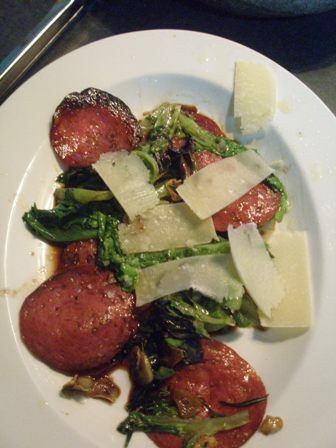 PS: We had some antipasti – fried salami – before the main course, a pasta. The recipe is from a Jamie Oliver cookery book. 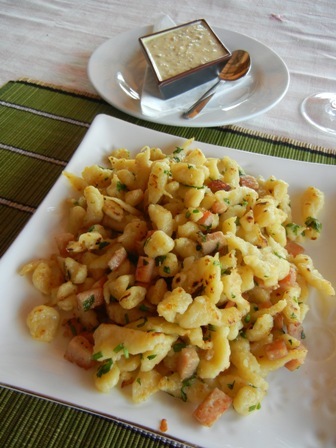 Wonderful, so tasty, with olive oil and fresh Parmesan cheese. 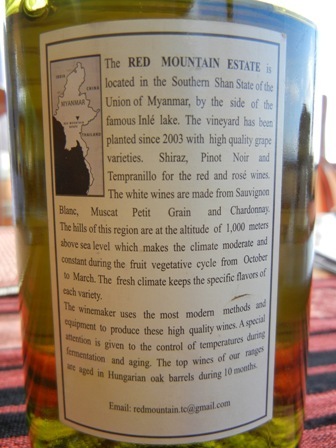 Did you know that also Burma (Myanmar) produces wines (some more “new latitude wines”, I guess)? 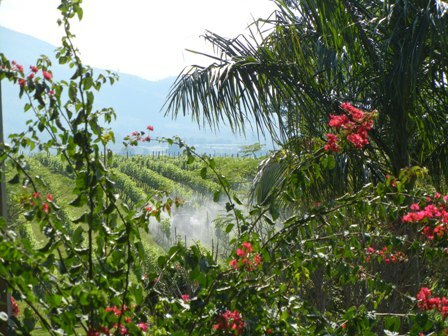 Well, that’s an exotic place to grow the noble grape vine, isn’t it. We know of Burma only that it is a military dictatorship denying Aung San Suu Kyi the win in an election 20 years ago. Cyclone Nargis comes to mind and the devastation it brought to the Irrawadi delta. But grape wines and wine production? Watch out. 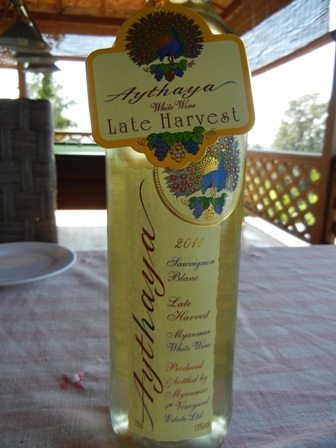 My friend Wolfgang brought me a bottle of Myanmar wine, to be precise a bottle of ‘2006 Aythaya Myanmar Rose Muscat’. 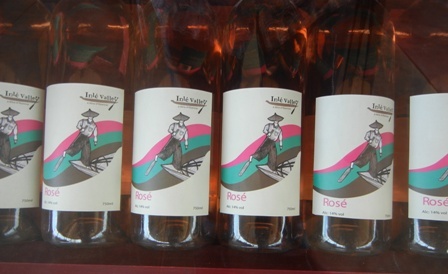 Grown in Aythaya village near Inle lake in the Southern Shan States at an altitude of 1,300 meters this rosé wine is produced by Myanmar Vineyards Estate Ltd.. It seems that a bunch of Germans up there is attempting to do the impossible and produce fine wines. The plastic cork was not to my liking. The colour of the wine, a deep rosé, however, was quite appealing. A slight aroma of raisin (is it from the Muscat? ), I thought to detect. The swish in the mouth was not what I expected. The bottle must have been exposed to some unfortunate conditions. I took a second sip. Not my wine, I must admit. No fruit, could be any liquid, I guess. 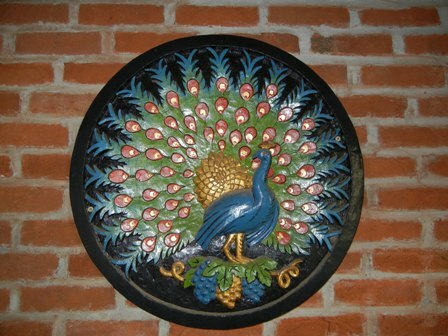 From the website of the estate I learned that the venture started in 1997 and that the first wine was made in 2004. 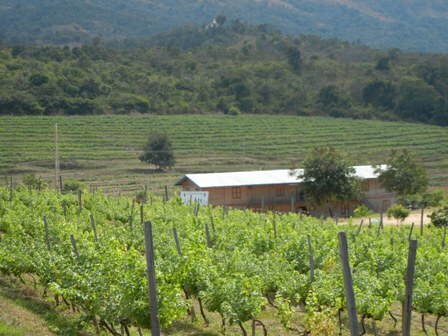 Exports started in 2006 and put Burma on the world wide map of wine production. I hope my next bottle will be OK. 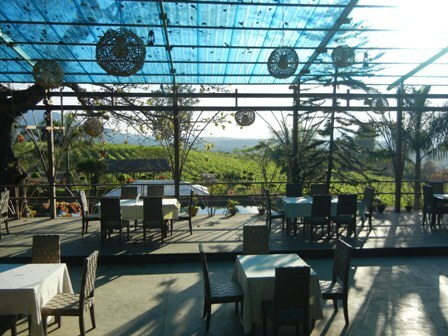 The grape varieties grown are Muscat, Shiraz and Cabernet Sauvignon. Also a Grappa is produced. 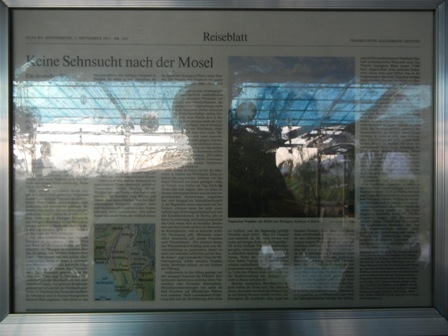 Unfortunately, one cannot access the references (articles in newspapers) given on the webpage. I will have to find out more about this vineyard. 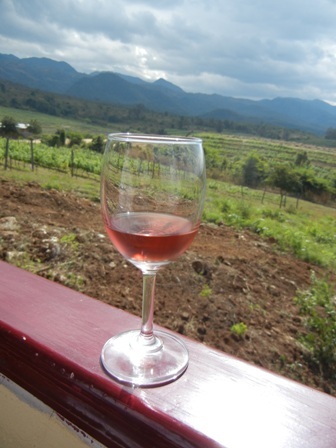 Stay tuned to Myanmar wines. Yesterday I got my visa from the Myanmar Embassy in Bangkok so that I can attend a meeting in Yangon next week. Last year I visited for the first time and stayed in a charming little hotel, called the Savoy. I know there are many more charming places in Yangon. I love the Savoy’s colonial atmosphere, the transquility and the quiet. 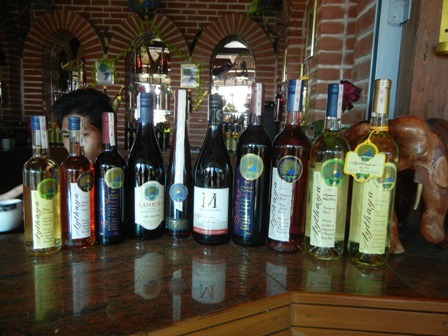 I alos liked the food and the wines. However, because of time constraints last time, I did not have a chance to talk to the cook. Why the cook you might ask? Well he is supposed to come from Luxemburg. That’s my Mosel neighbourhood. This time I am going to talk to him about food and wine. Restaurant at the second floor, Kipling’s what an enticing name. The wine selection is quite interesting; I remember Italian, Chilean and Australian wines. I will check them out next week. I’ll tell you more after my return. Keep tuned in.